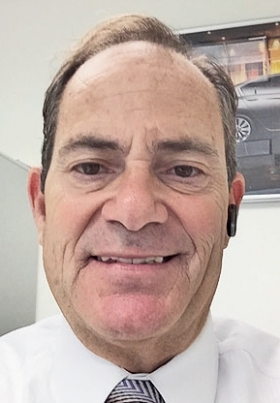 Glenn Roseman, finance manager at Unicars Honda in Indio, Calif., has cut his price for guaranteed asset protection, or GAP, products by more than half the typical rate to compete with insurance companies' prices on similar products, even though he believes his product is superior. "A little profit is better than no profit," he said. Insurance companies are pushing their way into GAP sales, tacking offers onto auto insurance. The list of heavyweight auto-insurance providers seeking to muscle into the GAP business includes Nationwide Mutual Insurance Co., Allstate Corp., Progressive Corp. and USAA. Some have a product similar to GAP but sell it under another name. For example, Progressive offers loan or lease payoff coverage and USAA offers total loss protection. At this point, most F&I managers believe they offer better-quality products, but an uptick in insurance offers eventually could pose a threat to dealers. As long as dealers and F&I managers prepare for the competition, their business shouldn't be at risk, dealer consultants say. GAP insurance comes into play when a vehicle is totaled in an accident or natural disaster. If the owner still owes more than the actual value of the vehicle, GAP covers the difference between the actual cash value of the vehicle and the outstanding balance on the loan or lease, so the owner isn't out of pocket. Many dealers dismiss insurance companies' efforts to add GAP to their product mix, which has happened periodically before, saying that those marketing efforts aren't making much headway as far as they can tell in their markets. But a significant minority is seeing an impact. 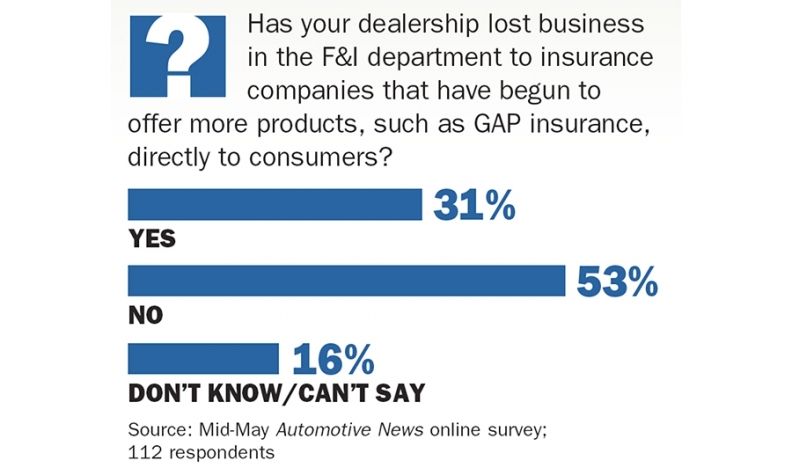 In an unscientific online survey of dealers and F&I managers conducted in mid-May by Automotive News, just under a third of respondents said they had lost business to insurance companies that offer new products such as GAP. 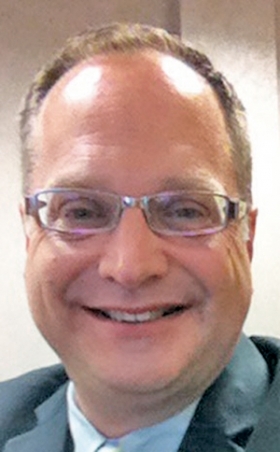 Eric Otken, finance manager at O'Brien Auto Park of Urbana in Urbana, Ill., hasn't felt downward pressure from insurance competitors. Choosing to buy GAP from the dealership is an obvious decision, he said. "GAP insurance was invented to protect the little guy from the bank and the insurance company," he said. Buying GAP from the dealership is "a logical approach, and I simply point out the differences" between insurance companies' product and dealerships' product. Otken: Buy GAP from dealers. 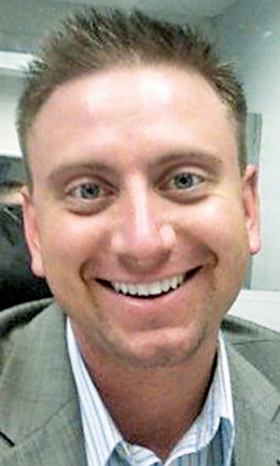 Although many insurance companies offer GAP, they still have to train a sufficient number of agents in how to present GAP insurance to consumers before doing so will become automatic, said Tim Meenan, executive director of the Guaranteed Asset Protection Alliance, a group of insurance companies, lenders and administrative service companies that offer GAP products. But that could change soon. Nationwide Insurance, for instance, offers GAP in 26 of the 45 states where it sells auto insurance. Spokesman Eric Hardgrove said Nationwide will offer GAP in all states where regulations permit in the next two to three years. Frank Batusic, finance director at Weil Cadillac in Libertyville, Ill., said customers "normally don't come up and say, 'My insurance company offers that.'" Batusic estimates that he has lost less than 1 percent of his customers to insurance companies' GAP products. He has noticed them more in the past year but said he doesn't think insurance offers are on the rise. "Most F&I offices will raise it as an option, and most insurance companies won't raise it as an option," Meenan said. F&I managers should understand the differences between GAP offered at the dealership and GAP offered by an insurance company, said executives from IDDS Group, which provides consulting services to dealerships. "Purchasing from an insurance company represents a huge conflict of interest that puts the customer in a dangerous position," said Max Zanan, vice president of IDDS Group. Every time a customer files a claim with an insurance company, the premium goes up or the customer is "dropped completely," Zanan said. In contrast, he said, with dealership-provided GAP, "the customer cannot be dropped, and your premium cannot go up." Even though Roseman, of Unicars Honda, lowered his price, he thinks his product is better than what insurance companies offer. Only 3 percent of his customers this year got GAP from insurance providers, he estimated. "If you have a good product and price it competitively," Roseman said, "you should make it in the market." Zanan said: "As long as [dealers] can recognize that these changes are happening and adapt accordingly, then [they] should be able to withstand this type of competition."